It is Kona Week, Baby! The excitement is running through social media from Instagram to Facebook to Snapchat, and a lot of triathletes can’t get enough. 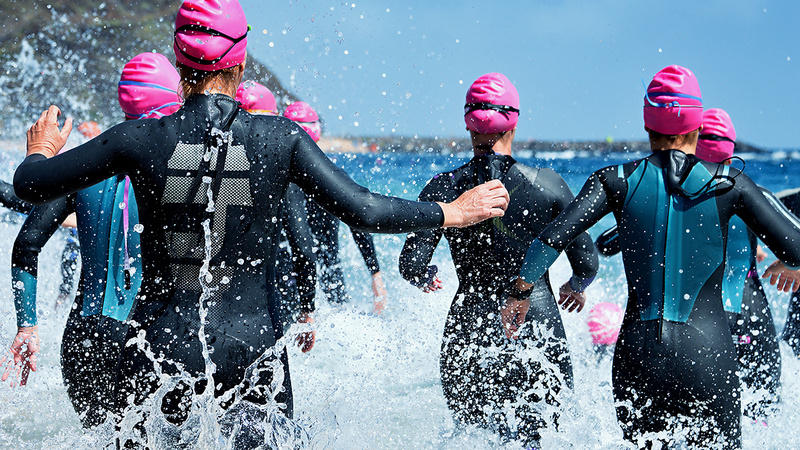 In my many years of triathlon training and coaching, I always assumed that EVERYONE started triathlons because of the IRONMAN World Championship. I mean, how could you not? With the epic scenery, feats of awesome strength, and inspiring stories, it’s hard not to want to be part of it all, right? Actually, people start racing IRONMAN for all sorts of reasons. I started asking my Instagram Followers and blog subscribers why they started racing triathlons, and got some pretty amazing (and wide-ranging) responses. “I thought, wow! They are so strong.” -Lili R.
Why did you start? I had been doing half marathons for a few years, and my friend suggested that we do an all-women’s duathlon that was part of a duathlon/triathlon race. I saw the women who were in the triathlon coming out of the water and thought “Wow! They are so strong. I want to do THAT.” So I signed up for my first sprint and haven’t looked back! What else would you like to share? I never thought I’d get up to 70.3 distance but now I want to do at least one a year. “We had joked about never turning 50, she didn’t” -Toni J. Why did you start? My best friend died suddenly, we were only a month apart in age. We had joked about never turning 50, she didn’t. I made a decision to do something that pushed me out of my comfort zone every year to celebrate given the opportunity to be 50. How many races have you done? Since my 50th birthday, I’ve completed 10 sprints, 6 Olympic distance, 4 70.3 Ironman Triathlons and in 2017, I did IM Florida. Anything else you want to share? In September 2018, I turned 55 and I’m planning my next IM distance. I celebrate Carol with each race. “It’s not about beating the person next to you, it’s the adventure to becoming a better you” -Kat N.
Why did you start? I became lazy after 20+ years as a soccer player. I started doing triathlons to prove to myself that I could do something of this magnitude, and I’ve kept doing them to show my players that what you put into your training is what you are going to get on game/race day. Now I love triathlons, I have caught the tri racing bug! How many races have you done? 1 Sprint, 2 70.3 IM and soon an Ironman in 2019! What advice would you share? When you trust your training and you prepare properly, race day becomes stress-free. All the hard work is done. As Coach Jen said to me before my last race, just go be amazing! It’s not about beating the person next to you, it’s the adventure to becoming a better you, and learning you can do more than you give yourself credit for! I mapped out a plan with some help from Pinterest -Jane A. As some of us go back to watching all the stories from Ironman World Championship and dreaming of that day to compete on the island of Hawaii with the best, others will head back to everyday life of being a soccer coach, a daughter, a Mom and a friend, who made changes in their lives for the better through triathlon. Jen Rulon is a USA Triathlon Level I Coach of 16+ years and owner of JenRulon.com. She received her Masters in Kinesiology with an emphasis in Exercise Science. You can find her knowledge shared in Triathlete Magazine, Runners World, on the TEDx State, Health and Wellness Expo in San Antonio, TX, Men’s Journal Online and The New York Times. She is a 13-time IRONMAN triathlete, who recently just participated at the IRONMAN World Championship with her husband, Chris.